Click on the image above to enlarge it, or view the same chart in PDF. 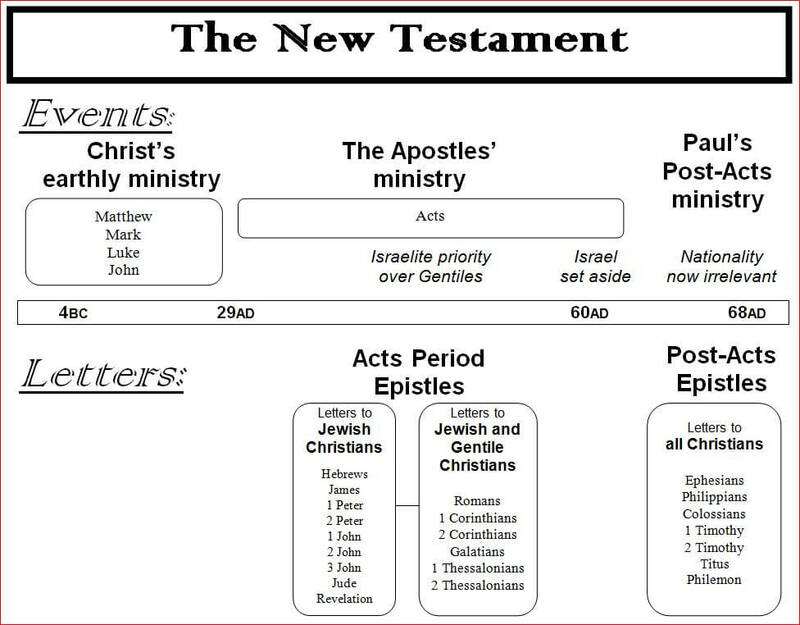 This chart helps to categorize the epistles or letters of the New Testament, and shows that they were all written either during or after the period covered by the book of Acts. Since God was still dealing with the nation of Israel during the Acts period in ways that He is not currently dealing with them, this has a bearing on what we find written in the letters either during or after the Acts period. 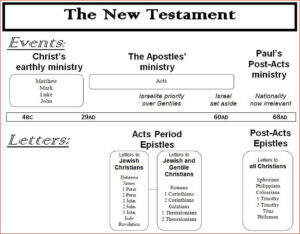 The chart above is a general outline of the New Testament books, and their relation to events at the time. Some of the dates on the chart may be questioned, but they are probably accurate to within two or three years either way. The top half of the chart shows the historical books of the N.T. These are Matthew, Mark, Luke and John, which cover the events of Christ’s earthly ministry (approx 4BC – 29 AD). This is followed by the book of Acts which, after Christ’s ascension into heaven, speaks of the activities of the apostles (approx 29 AD – 60 AD). After the events of the Acts period, there are no books of the Bible dedicated to historical events, though we do get a few snippets of events which took place after 60 AD in Paul’s Post-Acts epistles, the last of which was probably 2 Timothy (approx 68 AD). It should be noted that during the period covered by the book of Acts, Israel was still the prior nation in God’s dealings with mankind. Though there were Gentiles coming into blessing after Acts 10, they were still partaking of the plans which God had laid out for Israel. Romans 11 gives us an idea of this relationship in the picture of an olive tree (Israel), and branches which had been graft in to partake of her blessings (Gentiles). In the final chapter of the book of Acts, Acts 28, we read how Israel was set aside in God’s plans. It is important to read any book of the Scriptures in the context of conditions in force at the time. The letters of the New Testament speak of the conditions in force at the time they were written. Many epistles were written during the Acts period, whilst Israel was still God’s chosen nation, and had not been set aside. However, the later epistles reflect the character of the post-Acts period, in which nationality does not play any role in God’s dealings with mankind. You can read more about the differences between the two sets of epistles, before and after Acts 28, by clicking here.